The new Sustainable Development Goals (SDGs) will be announced roughly 200 days from now at the UN General Assembly in September 2015. These new goals will replace the current 8 Millennium Development Goals (MDGs). While governments debate how best to define this broad UN agenda, there are diplomats “who want to trim the long list of targets and NGO advocates determined to preserve it,” wrote Stewart M. Patrick for the Council on Foreign Relations. To achieve SDG Goal 2, the Open Working Group proposes 5 specific targets, of which one includes specific nutrition indicators. 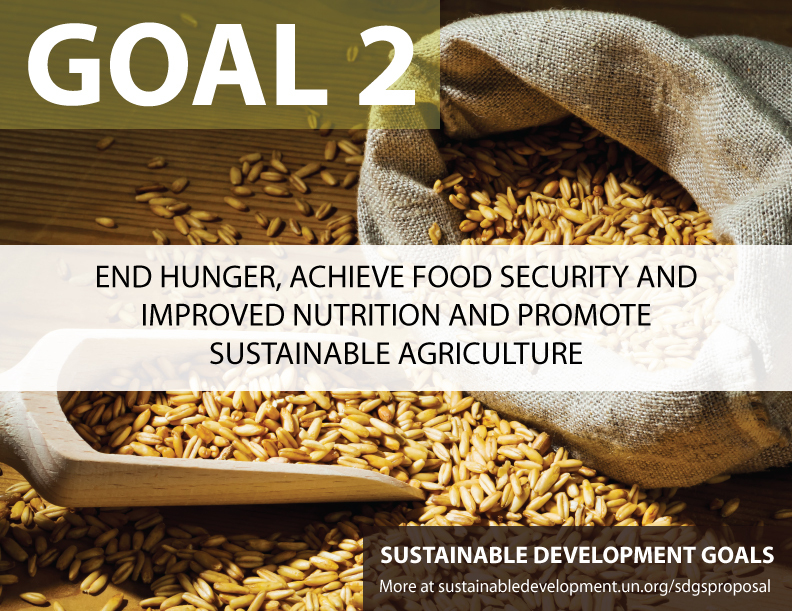 My previous blog post on SDG Goal 2 highlighted proposals by the UN’s Food and Agriculture Organization (FAO) as well as its 3 Rome-based agencies (FAO, WFP, and IFAD). This time I take a look at the Copenhagen Consensus Center and its research on nutrition and food security. As of January 23, 2015, the Copenhagen Consensus Center has published 18 research papers on “hunger and malnutrition.” In the most recent perspective paper, Susan Horton of University of Waterloo and John Hoddinott of IFPRI co-author a cost-benefit analysis of nutrition interventions. Stunting is “an excellent nutrition indicator to include in the SDGs,” write Horton and Hoddinott. 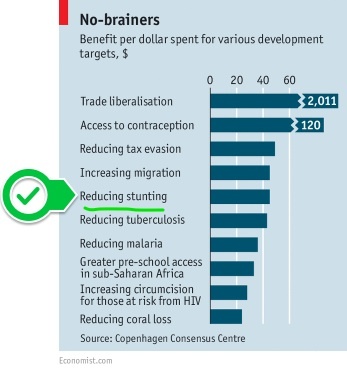 Indeed, the stunting receives the coveted dark green color by the Copenhagen Consensus Center, indicating its “phenomenal” cost-benefit ratio. It is good to see that the SDGs are considering an indicator like stunting that addresses chronic undernutrition. However, it seems that Target 2.2 is somewhat convoluted. On the one hand, it proposes ending “all forms of malnutrition,” but it specifies only 2 anthropometric indicators: stunting (low height-for-age) and wasting (low weight-for-height). Target 2.2 does not mention the other forms of malnutrition, specifically obesity/overweight (high weight-for-height) and mirconutrient deficiencies (often referred to as “hidden hunger”). It is also unclear how the SDGs will measure “address [ing] the nutritional needs of adolescent girls, pregnant and lactating women and older persons.” I’d like to see what the Copenhagen Consensus Center writes about these issues, too. This entry was posted in Nutrition & Food Security and tagged Copenhagen Consensus Center, food security, Millennium Development Goals, nutrition, Sustainable Development Goals. Bookmark the permalink.